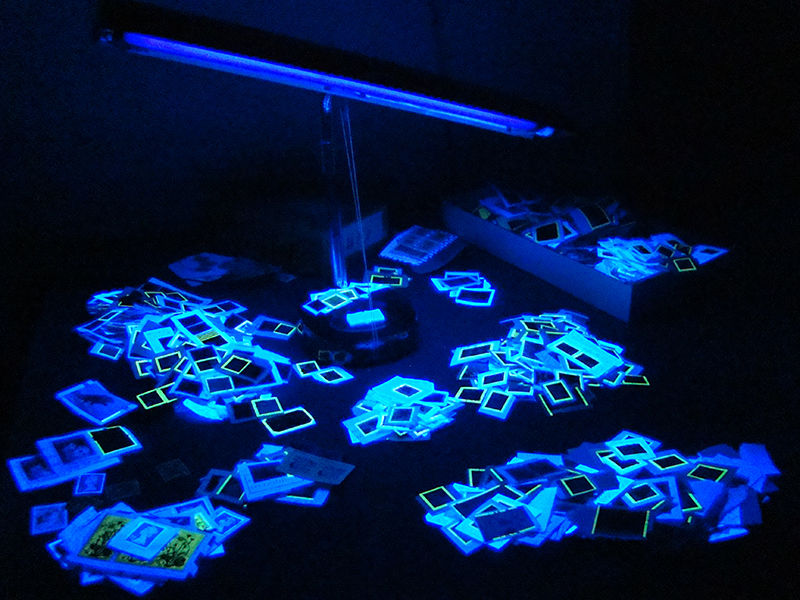 I am asked frequently, "what ultraviolet light do you use for checking tagging, fluorescence?" I would estimate that I check well over 100,000 stamps a year with the UV light. The UV light is a 'black tube' that fits into a goose-neck fluorescent-type lamp. This keeps both of my hands free for sorting/checking stamps. This type of light works extremely well for Canadian stamps (long wave) but it does not detect US tagging (short wave). Important: keep your eyes protected; wear prescription eye glasses or some other form of suitable eye protection. Work in a window-less room where the light can be turned off and provide complete darkness. 1. stamps to be checked (a bag sits on the floor and I bring out a handful at a time). 2. discard pile; those stamps that have been checked and nothing important was found. These will be given to children in a school stamp club which they will use to learn how to soak. 3. tagging errors that are found are placed on the base of the lamp. 4. I separate out, and keep, all Lowe-Martin coil stamps (flowers, olympics, animals) ... there are too many important die cutting varieties on these to discard any (except for damaged stamps). Also, the 50c Flower has both an important "ski slope" die cut variety and a rare "turquoise green background" variety, Unitrade 2072aiii (which needs to be checked with a short-wave UV light later). 5. Canadian commemoratives are separated. 6. Canadian definitives are separated. 7. foreign stamps are separated (USA definitives/Christmas are 'discarded'). 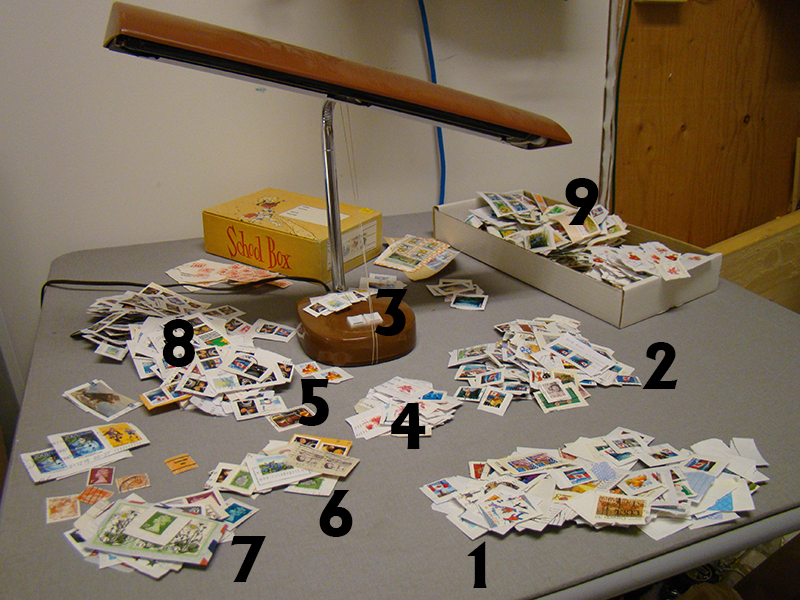 9. after checking a couple of handful of stamps, the separated piles (4-7) are then moved from the table into the box. Looks like I am going to need a bigger box! Actually, these stamps will be removed from here shortly and placed in other storage boxes and/or soaked and then looked at more closely.